← Do Journalists Who Cover Ontario Politics Know When the Next General Election Is Scheduled? The Canadian Press finally wrote a factually correct and accurate story pertaining to the timing of Ontario’s next general election. The election is currently set for the fall of 2018, but the Liberal government wants to avoid conflict with the next municipal elections, which are set for October of that year. That said, it would have been difficult to write an inaccurate story in this instance, since the whole premise of the article rests on the fact that the Wynne government just tabled a bill to switch the next scheduled general election from the fall to the spring. (2) Subject to the powers of the Lieutenant Governor referred to in subsection (1), general elections shall be held on the first Thursday in June in the fourth calendar year following polling day in the most recent general election. When this bill passes, Ontario will join British Columbia and Alberta in setting its scheduled general elections in the spring — where they really ought to have been all along — rather than in the fall. I’ve never understood why politicians prefer campaigning and door-knocking in the cold and dark of late fall. Ontario will also be the fourth province to have amended its fixed-date election law; Manitoba, Saskatchewan, and Prince Edward Island had already amended their equivalent statutes such that if the federal and provincial generals elections were ever scheduled to overlap in October, then their provincial general elections would be postponed by six months until the following April. This entry was posted in Fixed-Date Elections. Bookmark the permalink. 4 Responses to Finally, A Media Outlet Writes an Accurate Story on Ontario’s Next Provincial Election! One of the major issues in the ‘fixed election’ date legislation in all jurisdictions has been potential for overlap with other orders of government. In addition, the dates should be fixed from the date of the last election regardless of when it is, rather than a fixed date which has no relevance. We don’t have a tradition of Election Day, as the US does with the first Tuesday after the first Monday in November. All in all, ‘fixed elections’ have not delivered what was promised and they have had many unintended consequences. I did mention that point in my post on this subject from September, but I got tired of constantly reiterating it for all these journalists who don’t understand how our system works. 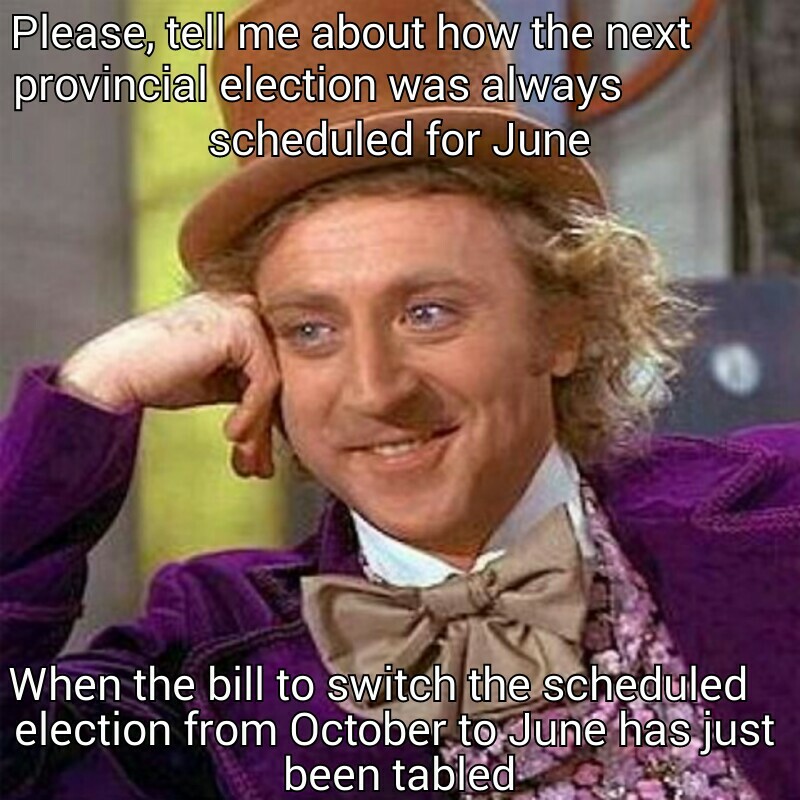 I agree–it is good to see the Provinces enacting uniform provincial legislation. But it remains the case in every Province that the proviso “[s]ubject to the powers of the Lieutenant Governor referred to in subsection 1[,]” prefaces these statutes. That’s important because it refers to the constitutional or royal prerogative of the Lieutenant-Governor-in-Council to call an election *anytime*. This is because the Constitution of Canada mandates that the provincial Premier can provide Constitutional Advice to the Lieutenant-Governor of a province at any time to use viceregal authority to dissolve the Legislative Assembly and require a provincial general election to be held at any time, so long as the constitutional prerequisites and formalities are adhered to. What may happen is that–over time–this statutory direction from the sovereign Legislative Assembly as to when elections are to be held may have the effect of making the choice on the part of the Premier giving Constitutional Advice to a Lieutenant Governor to draw up the writ of election *at a time other than that specified in statute* a more legally and constitutionally extraordinary event, than it is currently.